You gotta love a slice of trance and when the Dutch pairing of Benno de Goeij and Piet Bervoets, aka Rank 1, produce a new track it's usually worth listening to. 2013 has already brought the M.I.K.E. collaboration 'Elements Of Life' and the big room 'Floorlifter'. Their latest track, ‘13.11.11’, rolls out at a tempo of 131.111BPMs, with its deep, bass-building atmosphere. Backed by top FX, de Goeij and Bervoets drive home its first elevating lead line, one that seizes the track’s centre ground. ‘13.11.11’ swirls the atmosphere minute by minute, working its way towards its next sequence. Around the 9th minute mark, Rank 1 instils a savannah-like atmosphere to the track, enacted by its angelic indolent flute-led riff. Then they once again begin to draw the euphoria back in, raising the tension sky-high again. 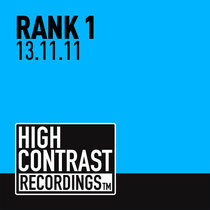 It’s out now on High Contrast Recordings, check it out below.